I love this time of year, when the summer turns into fall and I start sewing clothes for Sadie. Poor Delia gets the hand-me-downs but her grandparents usually kick in some pretty cute outfits for just her, so I will remind her of that later when she is 12. I was looking for kid shoes the other night, online, and stumbled upon this Dutch clothing company, Jottum, which I had never heard of. It made me a bit freaky, in the best way. No shoes, bit plenty of sewing inspiration. . 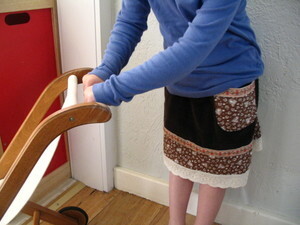 This skirt actually finally uses up that raisin mini corduroy. 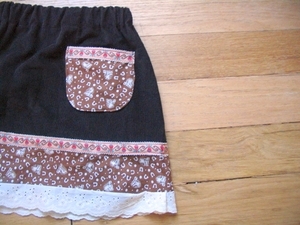 Not that this skirt has anything to do with the fantastic wonderful clothes over at Jottum, but I was inspired to make it, anyway, after visiting there. I am trying to make projects, from beginning to end, without going to the fabric store for anything at all, even notions. So, I have to have it on hand and use up what I have, because good lord, I have a lot. I was going to make this skirt all mod and minimal, but the horses, lace, and trim won out. The pocket is the most popular part with Sadie. She seems pretty impartial to the horses. I am starting her fall jacket next week. I have a pattern all ready to go from Ottobre. It's my first time sewing from this magazine and I was having a laughing fit the other night when I was trying to trace the pattern from the magazine. It's like a bad LSD spirograph freak out--so, we shall see how it goes. I am actually buying wool for this, I do have some on hand, but only enough for hats. I have read some good sewing tips over on the Ottobre yahoo group. Yahoo groups, man, they have one for everything!